A disappointing novel for me, more suited to dedicated fans of Norse mythology. I wanted so badly to like this novel. I loved the idea of it: a retelling of Norse legends from the perspective of the unreliable narrator Loki, aka the Trickster. I expected it to be funny, snarky and irreverent, and with a rollicking spirit of mischief. There were moments of this flair, but not enough to carry the story for me. 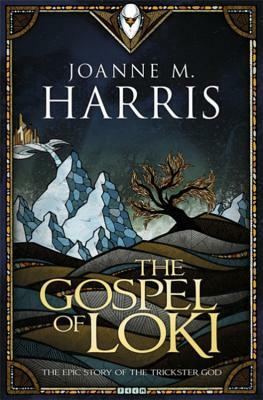 Those who are more familiar than I with Norse mythology would be better able to appreciate the ways in which Harris’ retelling reshapes the personalities and roles of the various gods of Asgard. For me, with only the vaguest knowledge of these tales, I constantly felt like I was on the back foot, left out of jokes that I had no hope of ‘getting’. I enjoyed the writing style and format of the book for about the first 60 pages. It felt like reading a light, snarky comic book. The chapters were short and each covered a specific ‘lesson’ that Loki learnt, or wished to impart to readers. However, the format began to get on my nerves, as there was no relief from the episodic nature of the stories within the story and the overarching narrative was painfully dull. Every chapter ended with some proclamation that doom was approaching, and yet doom appears no closer at all until the final 3 chapters. There were moments of respite, in particular I enjoy a series of chapters which dealt with Loki and Thor’s adventures together, but even this ended with a let-down as it contributed nothing much in the end to furthering the plot. Unfortunately this is not really expanded on or explored in any meaningful way, and readers are left to assume that Loki has learnt a lesson, though due to his almost complete lack of character development, this is hard to confirm. I think the first person past tense format hampered the ability of Harris to develop any of the characters in the story, from the outset Loki addresses readers directly and refers to himself as ‘your humble narrator’ frequently. This coupled with the constant assertions that he is ‘telling’ the story with the benefit of hindsight make it almost impossible to get a sense of the starting point for the protagonist, and creates a barrier of distance to the other characters who populate Asgard. My final criticism of this book relates to how it was marketed. I picked it up in the YA section, and the writing style is very simplistic, suggesting it would be suitable for the younger end of the YA market. But the content really doesn’t seem to align with that. There are mentions of things better suited to older audiences, and I would place this in the 16+ age appropriate range. Overall for me this book was really disappointing, but I can see how those who are more familiar with Norse mythology would enjoy this far more than I did. The writing overall is clean and clear, and there is a lot of humour. Greater understanding of the broader mythological context would definitely help smooth out some of the difficulties I had with the episodic style and the lack of character development. In many ways this reminded me of fan-fiction, where it relied heavily on prior knowledge to bulk out the story.